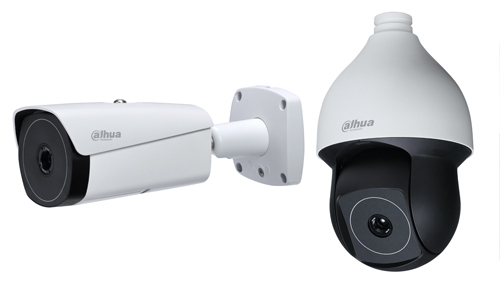 Dahua Technology has introduced the smart thermal network camera series for perimeter security applications and also for manufacturing sectors. The range includes thermal hybrid PTZ camera, hybrid speed dome camera, thermal bullet camera and thermal dome camera, all equipped with a variety of functions. The smart thermal camera sensor is reportedly capable of detecting tiny differences in temperature on static and moving targets and can function in complete darkness and adverse weather conditions. As such the cameras are ideal for detecting water leak behind a wall, a person hidden in the bushes at night, or identifying passengers with a fever passing through a checkpoint. The Dahua thermal hybrid network PTZ camera is a combination of a visual camera with integrated max 40x optical zoom lens and a thermal camera, synchronised in pan and tilt movements. The network camera can capture images in full scale without the need to step back or frame the shot. The lens focuses the infrared light emitted by all of the objects in view. It can deliver several independent H.264 streams for different quality needs and bandwidth constraints simultaneously. Dahua also provides software and accessories include smart PSS, NVR and DMSS to work together to meet the individual requirements of transportation industry, energy industry, border and coastal surveillance, etc and other special applications.